So Obvious That A Blind Person Could Tell! The world's most recognisable coin has also been among the world's most faked coin. 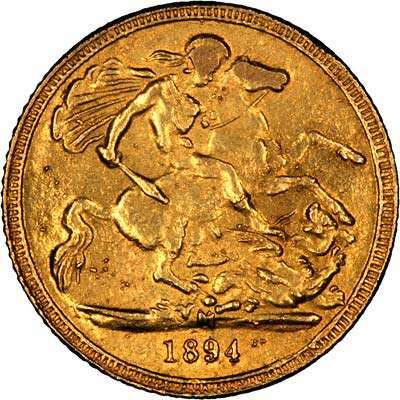 We illustrate on this page a number of counterfeit gold sovereigns. These are pictured to allow you to see if you could tell the differences, and also to bring to your attention the fact that forgeries do exist in sovereigns, as with almost all coins. We have chosen various qualities of forgery, all of which we find easy to detect in differing degrees, but all of which have at some time been bought as genuine. Don't buy gold sovereigns from a stranger, in a foreign country, or if the price is too good to be true. Buy only from a reputable dealer. Don't assume that a high price guarantees authenticity, either. The very obvious fakes pictured on this page were bought in Bahrain in about April 1999, at more than our asking price for the genuine article! Here are a selection of forgeries - can you tell the different at all? If you need help read on below. The top pair, showing both sides of the same coin, we have labelled as being obvious forgeries because they are obvious to us. Strangely, we find that when we show one fake and one genuine coin to most people, they cannot tell the difference. We can tell from about 6 feet away! Now we aren't bragging when we say this, but most people when presented with a forgery start to examine the coin very closely, looking for individual differences. Although small differences obviously do exist, the sum of all the small differences adds up to a very noticeable effect. We often try to explain it as being like the difference between an oil painting and a photograph. The photograph is completely flat while the painting has depth. The next pair we have labelled as being very obvious forgeries. They have actually photographed quite well, but they are too shiny, the milled edges are quite sharp in places, this is visible on the photographs. The colour of the gold looks too brassy, and the surface when examined closely has a very grainy texture. This grainy texture is typical of casting. Most poor and medium quality fakes have been produced by casting, better fakes are struck from steel dies like the originals. This single difference is sufficient to help spot most fakes. An additional clue on this particular fake is the border which is too wide, particularly on the reverse, and the date and the exergue space is too large and clumsy. This example is a very poorly made, and obvious fake. Strangely enough it came to us as part of a batch of 600 from another dealer. When we mentioned that there was a fake included, he apologised, explaining that he checks every coins, but must have been tired to miss this one, demonstrating that even an experienced eye can occasionally miss even an obvious forgery . Actually, in many cases a blind person could tell better than a sighted person. Some obvious fakes have a slightly too smooth, slippery feel, and as mentioned above, sharp edges or irregular milling. A blind person would detect these by feel, whereas most sighted people forget to use all their senses. Another sense to use is that of sound. Many fakes sound wrong, either when clinked together or when "rung" by dropping or spinning onto a hard surface. Once again, most blind people could and would detect these fakes, but many sighted people would fail to listen to the evidence provided by their ears. The cause of the different sound may be because the alloy used is incorrect, often of lower carat gold, but also because many fakes are produce by casting, and this produces a coin of lower density which is also softer. When metal is cold-worked, for example by striking, it becomes hardened, and this would affect its sonic properties . No, although there are dates which should cause greater alertness, there can never be any dates of any coin, which can be guaranteed not to have been forged. You may think that this is stating the obvious, but you would be amazed how frequently we get asked the obvious! Another type of forgery which should be easy to spot is a non-existent date or combination of date and mintmark. Take a look at the 1922 London Mint sovereign. The London Mint produced no sovereigns between 1918 and 1925, but it didn't stop counterfeiters producing them with no mintmark for these dates. 1917 is an extremely rare date of London mint sovereign, so we were delighted to be able to photograph the extremely crude and obvious fake shown. For ease of comparison, we also show a pair of photographs of the genuine article, this time a 1916 London Mint sovereign, quite a scarce date, whose scarcity in our opinion, is under-rated in The Standard Catalogue of British Coins. Naturally, all the coins we sell are guaranteed genuine. Between the 1860's and about 1881, platinum was used, in Spain, to counterfeit gold coins including sovereigns. These were apparently made to order for a North American, the coins being mainly destined for use in South America. Although platinum is denser than gold, by alloying it with an appropriate amount of copper, it can be brought to the correct density. It was then gold plated, and apparently made very effective counterfeits. The practice is believed to have stopped only because the price of platinum rose to an uneconomic level. It is likely that the fakes would be worth more now than the originals. Platinum fake sovereigns have been recorded of shield sovereigns dated between 1861 and 1872. We often see fake sovereigns, and other coins, being offered for sale as "restrikes". Read our articles here. A restrike is a retrospectively dated coins, officially produced or sanctioned or issued by the original mint or government, and as such is genuine if not absolutely original. The Austrian Mint have issued a number of restrike coins including the famous 1780 Maria Theresia thaler, and various gold coins, many dated 1915. One example of an official restrike is the 1925 London Mint sovereign. Until 1948, these were quite scarce, but in 1949 to 1951, the British Royal Mint issued sovereigns bearing the 1925 date, with a design identical to the original George V sovereigns. Because these are impossible to distinguish from the originals, they are not normally described as restrikes. Any "collector", dealer, or other vendor offering fakes described euphemistically as "restrikes" should be hung drawn and quartered!